However, MMT was very excited to watch the recent Herald Sun Prolog held last Wednesday 3rd February. For some reason MMT has managed to miss this event in previous years, but not this time. Located between 50m to go marker and the finish line, I managed to take a few reasonable photos as the riders zipped by. The 2 km course, was very technical and had a mix of surfaces, acute corners and proximity to the crowd that some of the riders would have found disconcerting. Nevertheless, last year’s winner Will Clarke and and runner up Caleb Ewan were again first and second over the same course. However, my favourite moment was watching Chris Froome sprint past, which I managed to capture in this sequence of photos. I’m guessing that this is about as close as I will ever get to a Tour de France winner, without being tackled by a security guard. MMT is relived that no blatant breach of copyright will occur in this latest blog, for a change. This entry was posted in UCI Events and tagged Caleb Ewan, Chris Froome, Herald-Sun, Melbourne, Prolog, UCI, Will Clark on February 12, 2016 by Marv. New Shoes, New Cleats….what could go wrong??? Last Wednesday, I managed to score the cycling equivalent of a home goal. Recently I’ve purchased a snazzy pair of Giro Rumbles, a light-weight lace up casual MTB shoe. Much to my surprise they didn’t come with cleats, rather fake bits of aluminium that were cleat shaped but were actually junk. 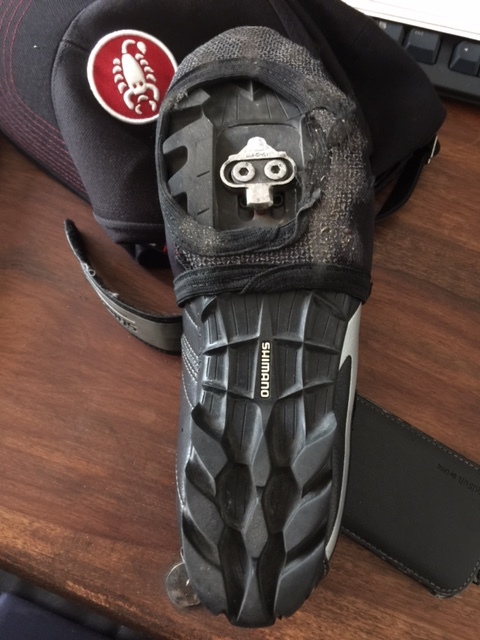 I purchased new SPD cleats the other day and fitted them to the shoes on the weekend. So last Wednesday, I finally got around to trying them out on my morning commute to work. As I cycled to work, I couldn’t remember whether I had closed the garage door. I looped around to check. Being back from holidays and a bit sleep derived, I thought a policy of ‘better safe than sorry’ was wise. So I pull up to a roundabout, give way to traffic, go to click out, when I discover I can’t. I think my exact word was “shiiittttttt!!! !” as I fell over in slow motion. I hate it when that happens. I feel so stupid for what was an easily preventable accident. This is where I committed my rookie error by not testing the click-in and more importantly click out. To make matters worse, whilst the right foot cleat has released, I couldn’t get the left foot cleat to clear. So I’m stuck to the bike and sprawled out on the road. A 30-something female power walker comes over and asks me if I’m ok. Apart from losing some skin on and jarring my right knee nothing seems too badly damaged. I thank her for her consideration and assure her that I’m ok. Finally the left cleat releases and I’m able to stand up. My ego on the other hand has taken a crushing blow. In short form, the cleats bolts loosened and this enabled the cleat plate to pivot round to an angle that was greater than amount of ‘twist’ I can manage on the ball of my foot. 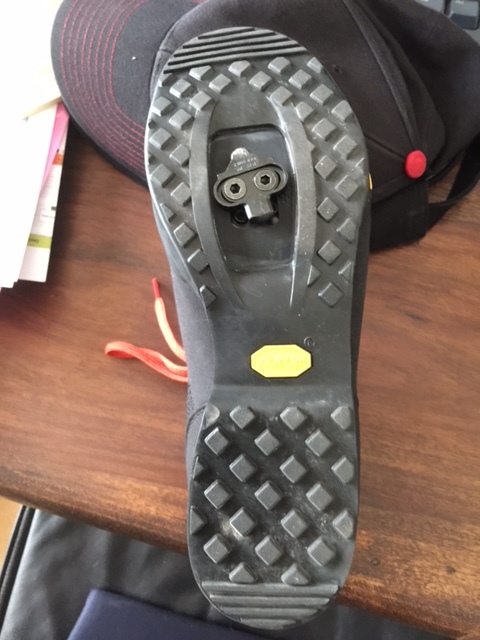 The cleats were able to move because I hadn’t done the screws up tight enough. Looking at the photos below you can see how much the cleat has pivoted around, out of position. A simple click in and out test would have detected this problem. Like I said rookie error. Stupid, stupid, stupid. Oh BTW the Herald Sun reckons Chris Froome is coming to Victoria to compete in the Herald Sun Jayco Tour this year. This entry was posted in Equipment, Humour, Maintenance, UCI Events and tagged Accidents, Chris Froome, Cleats, Rookie Error, Stupid on November 17, 2015 by Marv. In lieu of a proper blog about the shenanigans at 2015 edition of La Vuelta, for example various members of the Tinkoff-Saxo squad, most notably Peter Sagan, being struck by motorcycles and Chris Froome breaking his ankle, I thought I would provide another infographic. Its been liberated from the rather wonderful RCUK’s Infographic Guide to Cycling . I’ve provided the link to Amazon as shameless plug, hopefully, to ward off legal action for a blatant breach of copyright. Here at marvmadethis.com, we’ve long identified that infographics are the preferred communication media of the attention/literacy challenged Gen Y. For those of us not in that underachieving demographic, infographics occasionally capture something useful or entertaining. 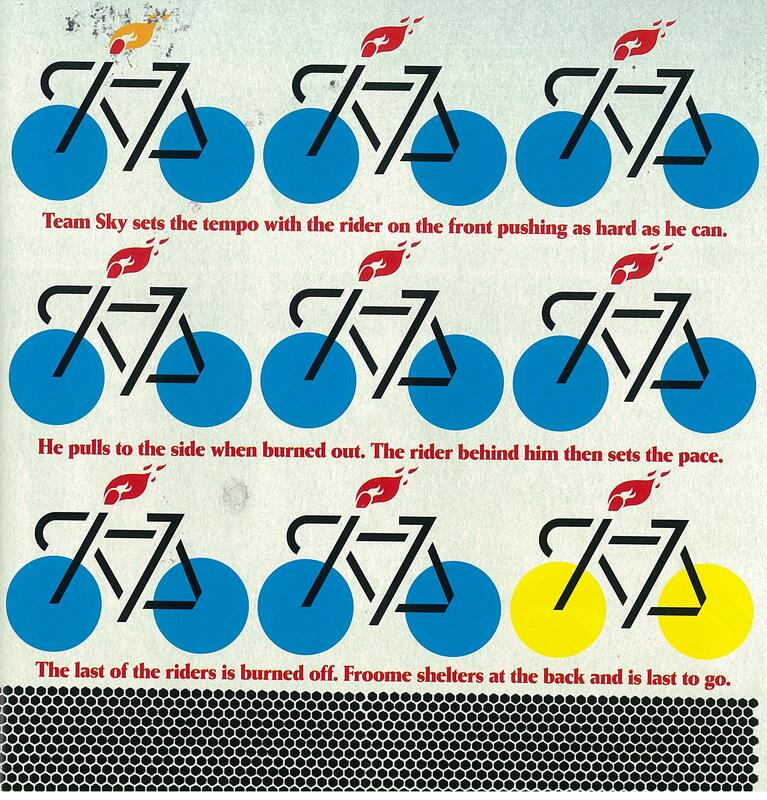 The illustration above does both, showing how Team Sky propel their GC rider, Chris Froome, along in a mountain stage. By keeping the tempo high, they attempt to prevent attacks from less well supported climbers, for example Alberto Contador. This entry was posted in Art, Grand Tour, Humour, Infographics, UCI Events and tagged Alberto Contador, art, Chris Froome, Infographics, Peter Sagan, Richie Porte on September 10, 2015 by Marv.